Q: What causes my smoke alarm to beep or chirp? 1) The battery may be loose, or improperly installed. Make sure the battery is fresh, and that it is snapped in all the way so it cannot be shaken loose. It’s possible that battery connections may not be making good contact with the battery. Disconnecting and re-connecting the battery once or twice will likely fix this condition. 2) The smoke alarm cover may be dirty. Dust and insects can collect in the sensing chamber of the alarm. An accumulation of dust in the sensing chamber can cause the unit to chirp. It is good practice to clean the smoke alarm when you change the battery. Most current model smoke alarms have a processor that retains certain error conditions, such as a weak battery. The error condition should reset when the battery is replaced but sometimes it does not and must be manually reset to clear the error. Turn off the power to the smoke alarm at the circuit breaker. Remove the smoke alarm from the mounting bracket and disconnect the power. Remove the battery. Press and hold the test button for at least 15 seconds. The unit may chirp or alarm for a few seconds before going silent. Reconnect the power and reinstall the battery. The unit will chirp once when the power is restored and should not chirp afterwards." Remove the battery. Press and hold the test button for at least 15 seconds. The unit may chirp or alarm for a few seconds before going silent. Reinstall the battery. The unit will chirp when the battery is first connected but should not chirp afterwards. 4) An electrical condition may be causing the power to the unit to be interrupted. If the AC power to the unit is interrupted, the unit will chirp when the power is restored. This could be caused by power surges. If the chirping seems to occur at about the same time in the evening or morning, it could be due to a surge created when the power company switches electrical grids to meet demand. Check to see if the chirp (or chirping) occurs when something else in the house is turned on such as an exhaust or attic fan, a heater, etc. If the smoke alarm is connected to a circuit with such a device, the alarm may chirp when the other device is switched on. If this is the case and the device is plugged into a wall outlet, move it to another outlet on a different circuit. If it is a hardwired device, have an electrician investigate it. Quell smoke alarms can be purchased from most major retailers nationally, several with online businesses. Q: What causes my Quell alarm to false alarm (alarm sounds when no smoke is present)? Many conditions that cause the smoke alarms to beep or chirp may also cause them to go into alarm when they sense smoke or something in the alarm chamber. 1) Age may be a factor. You should replace your alarm if it is over 10 years old. The date code can be found on the back of the alarm. - near kitchens where they may be exposed to smoke from cooking. - near bathrooms or areas where they may be exposed to steam. - areas that are very dusty, such as attics or garages. - areas that are in direct airflow such as near a heating vent or return. Check the location of the smoke alarm; try re-installing it a few feet away. Nuisance alarms can also be caused by external contaminants. 3) There may be dust or insects in the alarm chamber. Even in clean environments dust will collect in the sample chamber. This will cause the alarm to be overly sensitive and cause it to go into alarm. Insects can have the same effect and the movement of the insects in and out of the chamber will cause the alarm to go into alarm. If the unit seems to go into alarm mostly at night, it is probably due to insects. 4) Cleaning solvents (particularly ammonia), Latex paints, and high dust conditions associated with construction can cause the unit to go into alarm. Eliminate the condition and clean the alarm. 5) Reset the unit. Disconnect the alarm from the electrical power (if applicable) and remove the battery. Hold in the test button for approximately 10-15 seconds. This will reset your alarm. Re-install your alarm after this procedure. Q: Why does the red light blink once every 40 seconds? Q: What type of battery can I use in my Quell alarm? Quell Alarms are certified to be used with the models of batteries specified in the user manual. Q: Where can I buy Quell products? 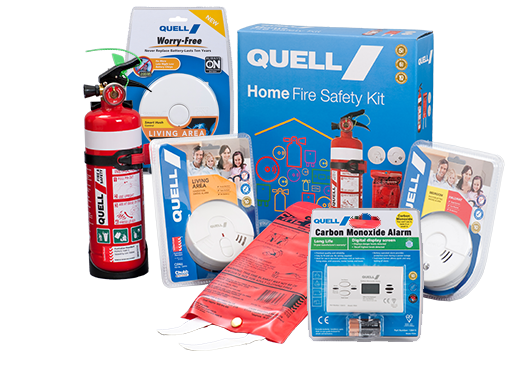 Quell products, including smoke alarms, CO alarms, and combination alarms are available through most major retailers nationally. Q: Why does the alarm go off during cold weather? The unit may go into alarm only when it is very cold out or if a door adjacent to a heated area is opened, such as in an entry way. Do not install in areas where the temperature is colder than 5°C or hotter than 45°C. • Do not install in areas where the relative humidity (RH) is greater than 85%. Q: How often should the battery be changed in my smoke alarm? It is recommended that the battery in every smoke alarm be replaced at least once a year to ensure it is operating properly or any time the unit indicates that the battery is weak. The general rule is to replace the batteries when we switch to daylight savings time and / or when we switch back. When the battery requires replacement, the alarm will sound a short beep or chirp approximately once every minute. At this time you must remove the old battery and replace it with a fresh battery of the correct type. Q: What is the warranty on Quell smoke alarms and how do I get it repaired or replaced? A replacement unit will be sent to you. Q: What should I do if nothing happens when the TEST button is depressed? Please include your address for shipping and a brief description of the problem. A replacement unit will be sent to you. Q: What is the difference between ionization and photoelectric type smoke alarms? Quell fire alarms use two main sensor types to detect fires in residential environments: ionisation and photoelectric. Quell also manufacture alarms specifically designed to detect the presence of carbon monoxide in the atmosphere. It is important that you consider your home environment and choose the right alarm for your room. Quell’s range of photoelectric smoke alarms have been designed to detect the types of fires that can smoulder for hours before bursting into flames. Photoelectric sensors are capable of detecting the larger smoke particles produced by burning foam, rubber and synthetic materials. Quell’s ionisation smoke alarms are designed to detect fast flaming fires as well as other fires that produce smaller smoke particles. Ionisation sensors are suitable for detecting burning paper, wood and flammable liquids. Q: When does steam from the bathroom or smoke from the kitchen set off an alarm? Ionization type alarms are sensitive to smoke from the kitchen and steam from a bathroom. Consider moving the alarm a few feet away to avoid the condition. You can also consider using a photoelectric alarm near areas that are prone to steam or cooking smoke. Photoelectric alarms are less sensitive to these conditions.